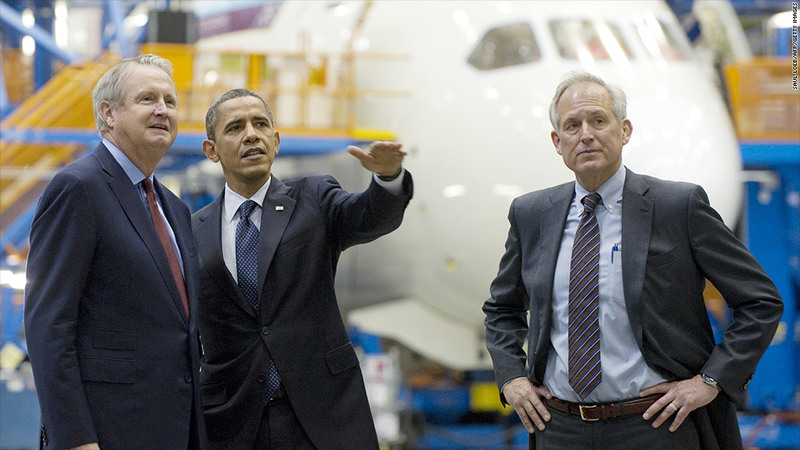 Last year, President Obama toured a plant that builds Dreamliners along with Boeing CEO Jim McNerney (right). With Boeing's flagship Dreamliner airplane grounded, the nation's largest aircraft manufacturer could soon need to test its clout in Washington. Boeing (BA) has deep ties with the federal government as a top supplier of aircraft to the U.S. Air Force. It has also worked aggressively to draw high-profile attention to its Dreamliner jets. Last year, President Obama visited a Boeing factory that makes the 787 Dreamliners in Everett, Wash. The visit was used to drum up support for a federal agency called the Export-Import Bank, which provides loans and guarantees to foreign countries so they can buy U.S. products. U.S. taxpayer guarantees, via the Ex-Im bank, have helped finance sales of Boeing's 787 Dreamliners to airlines of countries such as India, Poland and Ethiopia. In fact, 65% of the $15.3 billion worth of loan guarantees that the Ex-Im bank issued in 2007 and 2008 went to help foreign countries buy Boeing aircraft, according to a 2009 report issued by the nonprofit Pew Charitable Trusts. Last year, Congress reauthorized the Export-Import Bank by four years, and raised its loan limits to $140 billion. Experts say Boeing's influence in Washington helped settle a high-profile labor fight with the National Labor Relations Board. After Boeing's union reached an agreement, the federal agency dropped a complaint against Boeing for building a new non-union plant in South Carolina that helped make Dreamliner jets. Boeing's influence also extends to the FAA, which last week announced a probe into the design, manufacture and assembly of the Dreamliner after problems first began to surface. On Wednesday, the FAA grounded the Dreamliner in the United States, a move that resulted in taking all 50 planes worldwide out of service. The Dreamliner, Boeing's newest airplane, is made of lightweight materials and uses 20% less fuel while being 60% less noisy than similar planes. It also flies the longest distance for a midsized plane that holds up to 250 passengers. The plane is widely seen as playing a key role in Boeing's future. It started commercial flights in October 2011. Boeing has orders for 800 more Dreamliners, but so far the only U.S.-based carrier to put them in service is United (UAL). The FAA has worked very closely with Boeing to get the Dreamliner certified safe for air travel at a faster-than-usual pace, according to consultant and former airline executive Robert W. Mann. He said that the FAA was under pressure to fast-track approval of different design parts of the 787 Dreamliner because of the excitement surrounding the aircraft. "When you start to stack up very innovative solutions, either as designs or as processes, any one of these is OK," Mann said. "But when you start to build an aircraft entirely out of very innovative approaches to problems, you start to think, do you really want to allow the oversight agency to hurry along the certification process?" Boeing's influence in Washington partly stems from its position as one of the nation's largest manufacturers, with a workforce topping 150,000. As a larger defense contractor, its fortunes trickle down to myriad other companies and industries that supply parts. Boeing spent $11.8 million on lobbying last year and $3 million during the latest election, according to the Center for Responsive Politics. Boeing competitor Lockheed Martin (LMT) came in second place, among big aerospace firms, spending $11.5 million on lobbying, according to the center. Obama tapped Boeing CEO James McNerney to chair the President's Export Council in March 2010. 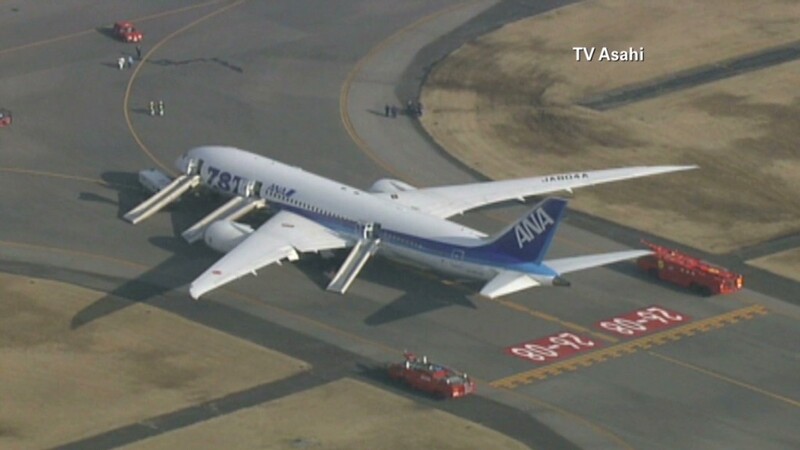 McNerney has sought to calm fears about the Dreamliner. On Wednesday, McNerney said in a statement that he is "confident the 787 is safe and we stand behind its overall integrity." Calls and e-mails made to Boeing seeking comment for this story were not returned. The FAA had no immediate comment on the story.